The Topz gang are back in this new book all about the Heroes of the Bible, and how their lives relate to growing up today. Want to engage 7-11s with God's word? Who's your favourite Bible hero? Did they make the list? Join in with the Topz gang as their very favourite heroes of the Bible are listed, from 10 to 1 and what each one has to say today! From learning to stand up for your faith, to what it means to be true friend when it counts, these tops 10 Bible heroes are full of lessons to last a lifetime. Each hero's story is told with puzzles, colouring pages, activities, and lots of different ways to engage with them. Made to appeal to 7-11 year olds, these stories are perfect for home, as well as Sunday School. So discover the greatest heroes of the Bible, what why they are at the very top. Topz 10 Heroes of the Bible Benny and Paul by Alexa Tewkesbury was published by CWR in July 2017 and is our 1848th best seller. 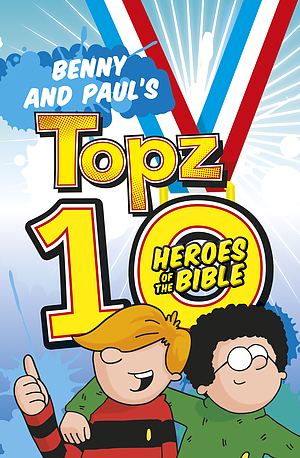 The ISBN for Topz 10 Heroes of the Bible Benny and Paul is 9781782596875. Be the first to review Topz 10 Heroes of the Bible Benny and Paul! Got a question? No problem! Just click here to ask us about Topz 10 Heroes of the Bible Benny and Paul. With the help of the rest of the Topz Gang, Paul and Benny have put together their very own Topz 10 list of Bible heroes! Each hero teaches them something about life - from friendship and loyalty to bravery and standing up for others. Full of Bible verses, questions from the Topz Gang, puzzles, quizzes and other activities, this book is designed for readers to fill with their own ideas, discoveries and prayers. Written by Alexa Tewkesbury. Perfect for boys aged 7 to 11.